I’ve answered the question “why do I create?” a few times over the course of the past year. It seems harder to explain than it should be! The short answer is that I’ve been making stuff since I was little. My mom is a talented seamstress who began quilting in the ’70s. She fostered my creative adventures and taught me many of the skills I use today. I went on to get a BFA in Crafts (yep! that’s a thing!) from Virginia Commonwealth University My only regret is that I focused more on metalsmithing than textiles. Quilting is something I dabbled in from college onward. I got serious about it a few years ago with the modern quilting movement. I am a freelancer who wears A LOT of hats but I try to devote a portion of my week to working on quilting projects and sewing related ideas. p.s. 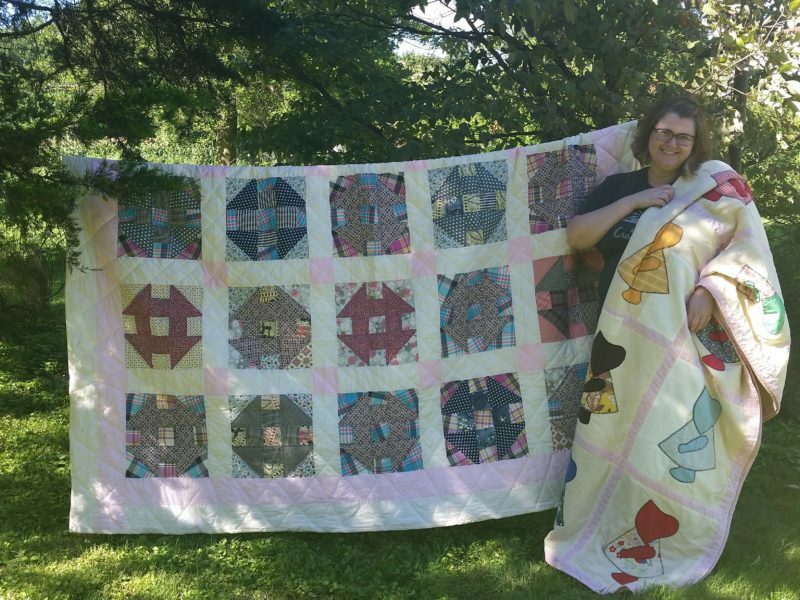 the photo is me with two of my “legacy quilts” – quilts made by women in my family (and now cherished by me!). Quilty Box featured it one of their social media campaigns.